After 24 years behind the bar at the Grassroots Tavern on St. Mark's Place, John Leeper has retired. We've been trying to guess his age for years. Best guess is between 75 and 80. His last day was Friday. We're told that a large contingent of regulars from the 4-9 p.m. shift — the times that John normally worked Tuesday through Saturday — were on hand to see him off. According to an afternoon-shift regular, as John left the Grassroots at 9 p.m. for one last time, the entire bar sang "For He's A Jolly Good Fellow." He stood at the door with his wife, a high school teacher in Brooklyn. He had tears in his eyes. He waved goodbye and headed into the night. Per the regular: "The Grassroots will never be the same." Indeed. We've enjoyed his company through the years. John was always good with a story — tall tales or otherwise. We've heard amusing anecdotes about everyone from Joe Namath to Reggie Jackson to (rather randomly!) Claude Akins. He talked about running some after-hours joints in the West Village in the 1970s full of colorful characters, like Jimmy the Slabman. He tended bar for Hilly Kristal in the early 1970s when Hilly had a place over on Sixth Avenue at Ninth Street. 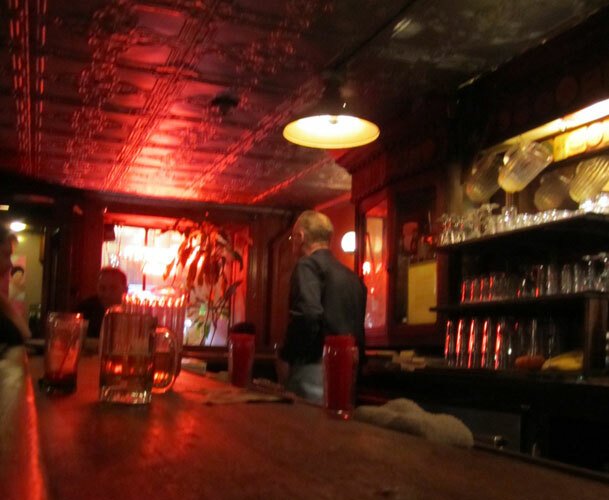 John followed him over here, working briefly at Hilly's on the Bowery, the bar that would later become CBGB. He had a few funny Hilly stories. But he was never nostalgic. Maybe a little too matter-of-fact at times. John didn't have much patience for bar incompetence. You didn't want to be the person who walked into the Grassroots and ask what kind of beer was on tap when you're standing in front of one of the carefully placed beer lists on the wall. He particularly disliked when, say, four after-work types ordered a $7 pitcher of Budweiser. And all four people fumbled around their wallets or pockets looking for their $2 portion. Why doesn't one person pick up the round? He also lamented that no one read anymore, saying this while watching people who were by themselves at the bar playing with their various smartphones. But stories and bar etiquette aside, he knew what to say when it mattered most. A job loss. A challenging situation at home. He often served as a father figure. We always knew where to find him. And it seemed like he'd be there forever. great barkeep, one of a dying breed. sad that i'll never see him behind the stick again on a quiet weeknight evening. Sixth Avenue and 9th Street? Was it Trude Heller's? Anyboody know? Only been to Grassroots a few times and sadly never got to meet John. Sounds like a classic and great bartender. Cheers to him and I wish him the best in retirement! Grassroots is one of those places that has always been there, stable and steady the way I like it. I can't say for sure if I was under age at the time, but it was a regular stop for me during those blurry high school and college years. Even when I went in during the past 15-20 years it never seemed to change, a comforting place to have a beer with a friend. only reading this now. john was very kind to me when i really needed it one day. didn't realize he had left and sorry to hear it. i belive his wife is sick and i wish the two of the the absolute best of luck, love, and life. John Leeper passed away last weekend. One of the greatest bartenders of all time.